Ford has recently updated its flagship SUV, the Endeavour, for 2019. The SUV now gets a slightly reworked exterior and a few additional features. And today, we pit it against the segment sales leader, the Fortuner, to find out which of the two SUVs offers a better value for money in terms of features on offer at a comparable price. The Endeavour is longer, wider and taller than the Fortuner. It also has a longer wheelbase. Where the Endeavour is available with two engine options, the Fortuner can be had with a single engine only. The Fortuner’s 2.8-litre unit makes 17PS more than Endeavour’s 2.2-litre unit but 23PS less than Ford’s 3.2-litre engine. Both the SUVs are available with a 6-speed MT/AT and 2WD and 4WD options. In the Endeavour’s case, the smaller engine can be had with the 4x2 option only, but with both manual and automatic transmission options. The bigger 3.2-litre engine can be had with AT and in 4x4 format only. 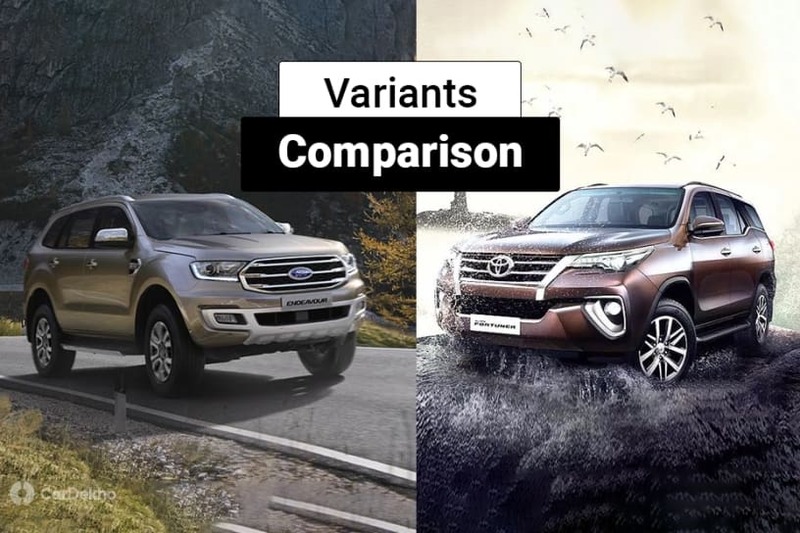 Variants comparison: We will compare only the similarly priced variants of both the SUVs (price difference less than or equal to Rs 80,000). Safety: Seven airbags, ABS with EBD, ESP, ISOFIX child seat anchors, traction control hill launch assist and hill descent control (only on 4WD variants of both the SUVs). Exterior: Projector headlamps, LED DRLs, LED tail lamps, front and rear fog lamps and alloy wheels. Interior: Leather upholstery and foldable rear seats. Comfort: Electrically adjustable and foldable ORVMs, dual-zone climate control, tilt-adjustable steering, powered front seats, auto dimming IRVM, rear parking sensors with camera, push-button start, all four power windows, powered tailgate and cruise control. Infotainment: While the Fortuner comes with a 7-inch touchscreen infotainment system, the Endeavour gets a larger 8-inch unit. What Ford Endeavour 4X2 and 4X4 offer over the Toyota Fortuner 4X2 and 4X4: Panoramic sunroof, front parking sensors, hands-free parallel parking assist, power folding rear seats, Apple CarPlay and Android Auto support for infotainment system, terrain management system (only in 4WD variant), ambient lighting, auto headlamps, rain-sensing wipers, emergency assistance, active noise cancellation and tyre pressure monitoring system. What Toyota Fortuner 4X2 and 4x4 get over the Ford Endeavour 4X2 and 4X4: LED headlamps (Endeavour gets bi-xenon HID units), LED front fog lamps and telescopic adjustable steering. Verdict: The 2019 Endeavour is our choice here. Despite being more affordable, it is way more equipped than the Toyota and the only major miss is the telescopic steering adjustment.